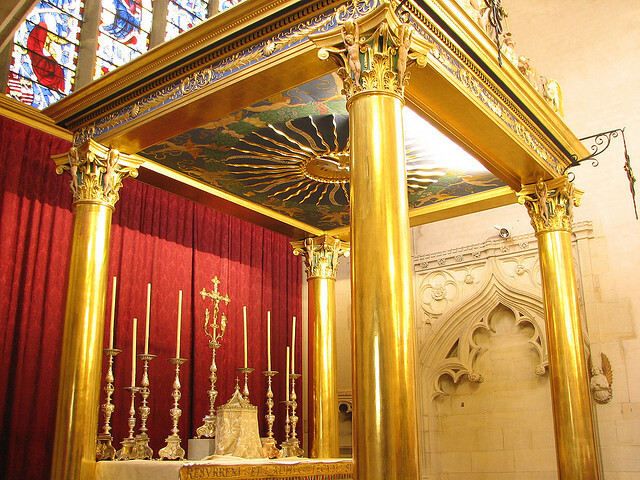 Chapel of the Resurrection In the chapel of the Pusey House Fathers in Oxford dedicated to the Resurrection, the eye is led straight to the Altar surmounted by its golden baldachino, and fronted by a golden antependium, both by Sir Ninian Comper. The next day he was dead; then on the first Easter Day he was alive again. Since then Christians have always done what Jesus asked us to do - we take bread and wine, repeat the words of Jesus and receive the bread and wine which we believe God has now transformed so that it holds the real presence of Jesus. It is the holiest thing that Christians do. When we take the bread and wine we meet the risen Jesus - so this is also known as Communion ('communion' means to meet at a deep level.) The service is also known as the Eucharist, since 'Eucharist' means to give thanks. 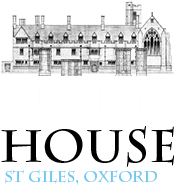 At Pusey House the Mass is celebrated daily and is at the centre of our worship since it is the service given to us by Jesus himself.